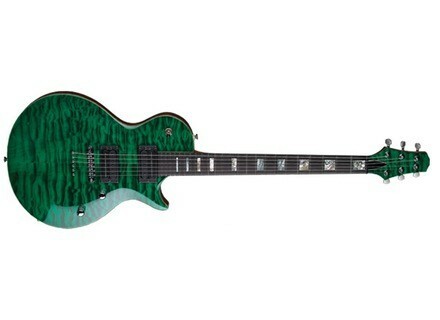 CS624M - Deep Green, LP-Shaped Guitar from Carvin in the California series. Carvin offers their California Single guitars in new 24-fret versions. Like the 22-fret CS6, CS4, and CS3, these new models arecrafted at Carvin's San Diego Custom Shop from mahogany for the body and set neck, ebony fingerboards, and abalone dot inlays. The new CS624 features a standard 4A flamed maple top and matching headstock, which can be finished in any of Carvin's deep triple step finishes. Optional top woods, including 4A quilted maple, flamed Hawaiian koa, flamed spalted maple and burled maple are available with natural binding. The standard ebony fingerboard sports medium-jumbo nickel-silver frets, and many other fret choices in nickel and stainless steel are available, as are other fingerboard woods such as rosewood, birdseye maple and flamed maple. The CS424 has the same features as the CS624, with a plain maple carved top, which can be finished in any of Carvin's standard solid, optional metallic, or optional translucent finishes. The CS324 has no top wood, just a beautifully sculpted mahogany body, which can also be finished in Carvin's translucent or solid finishes. Medium-jumbo frets, Sperzel locking tuners and a 24K gold headstock logo complete the package, and Carvin's hundreds of Custom Shop options are available for custom-tailoring the guitars. All three models are equipped with Classic Series C22 pickups, a master volume control, master tone control that doubles as a push/pull coil splitter, and a 3-way pickup selector. [NAMM] GJ2 Guitars Arete Grover Jackson, the luthier behind Jackson Guitars, has launched a new guitar company called GJ2 Guitars. Collings 290 S Collings is offering the single Dog Ear P-90 pickup configuration to their original single cutaway 290 design. JHS Paul Smith Vintage Paul Smith and Vintage are launching a new limited edition compact Vintage acoustic model exclusively for Paul Smith shops.